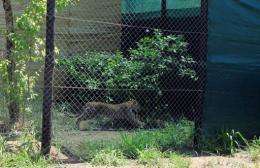 A leopard runs in an enclosure after it was transferred from South Africa to Malawi's Majete Wildlife Reserve. This is part of an animal repopulation project between South African and Malawian nature reserves. Antelope, elephants, leopards and lions are grazing and reproducing again in a reserve in Malawi, resurrected through a repopulation project of biblical proportions. In only eight years, South African NGO African Parks Network reintroduced over 2,500 animals in the sprawling Majete Wildlife Reserve next to the Shire, the main river in the landlocked southern African nation. "Majete is a success story of a Noah's Ark operation," Peter Fernhead, the head of the organisation said, referring to the biblical story in which Noah repopulates the earth after guarding animals and his family in a big ship during a global deluge. The reserve was launched in 1955, but poachers gradually hunted almost all the animals. Only a few baboons remained in the 700-square-kilometre (270-square-mile) park when African Parks took over its management after signing a 25-year partnership deal with the Malawi government in 2003. "There was no control actually. The last elephant was poached in 1992," said the park's director Patricio Ndadzela, adding that a decade ago there were several hundred. "No tourist came to this place. There was simply nothing!" Majete has since become the new home of 742 impalas, 359 sable antelope, 306 buffalo, 250 elephants, 177 zebras, 158 warthogs, seven black rhinos, and four leopards. And the list goes on. 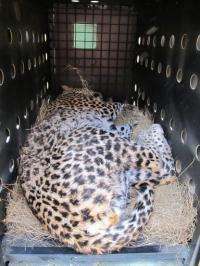 A sedated leopard lies in a cage in Hoedspruit before its transfer to Malawi. In only eight years, South African NGO African Parks Network has reintroduced over 2,500 animals in the Majete Wildlife Reserve. "We only relocate animals that once were present here," said ranger Fyson Suwedi, which means no giraffes or ostriches will be brought to the reserve that is now completely fenced. Next June, some lions will arrive to complete the Big Five collection, Africa's five trademark animals that are a major tourist draw: lions, leopards, elephants, rhinos, and buffalos. African Parks has built new roads as well as a reception centre with a curio shop and restaurant. It also refurbished the base camp, where elephants pass by the window while you brush your teeth. The organisation has invested $15 million (11.5 million euros) to revive the park. Currently, 85 percent of Majete's yearly budget -- around $1 million -- comes from donations. But more revenue may pour in with the opening of a luxury lodge to be run by a private operator, especially if it attracts foreign visitors. "With the new lodge, we will start marketing this place for international tourists," said field operations manager Dorian Tilbury. Veterinarian Andre Uys (L) inoculates a sedated leopard before its transfer to Malawi. Majete has since become the new home of 742 impalas, 359 sable antelope, 306 buffalo, 250 elephants and four leopards. The reserve also hopes to attract more local visitors despite high poverty levels. Malawi's biggest city Blantyre is only 70 kilometres (43 miles) away. Locals are also reaping the benefits. "Most of the people employed here were probably poachers. They had to poach for meat, there is no economy in this area," said veterinarian Andre Uys, who oversaw most of the animal transfers. Around 130 people and at least as many seasonal workers from the local community have jobs at the reserve. "Our objective is to make sure that the value generated by the park is captured by local people for local people," says Fernhead. Locals also have a new clinic, a school and water sources thanks to African Parks. The organisation manages seven parks on the same model in six African countries: the two Congos, Malawi, Rwanda, Chad and Zambia and is soon to open an eighth.